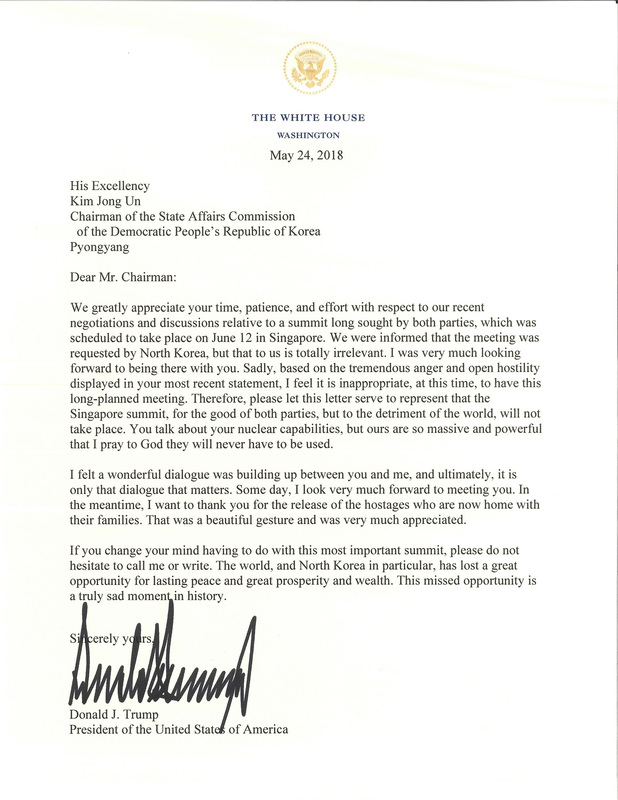 President Donald Trump canceled the U.S.-North Korea summit scheduled to take place on June 12, he said in a letter Thursday. The president referenced recent incendiary comments from North Korea about Vice President Mike Pence. “Sadly, based on the tremendous anger and open hostility displayed in your most recent statement, I feel it is inappropriate at this time, to have this long planned meeting. Trump noted that he still hopes to meet Kim Jong Un at some point if their regime agrees to the terms set out by the U.S. and said if he changes his mind that they should not hesitate to reach out. The president thanked the North Koreans for releasing three U.S. hostages detained by the regime under false pretenses.